Work-related stress leading to physician burnout continues to be a growing concern across primary care and medical specialties. Although stress is part of the territory in a profession that is literally charged with making life and death decisions, burnout occurs when physicians are unable to regroup and return to a place where they are engaged and fulfilled by their career. Dike Drummond, MD, founder and CEO of The Happy MD and author of several books on physician burnout, noted the downward spiral into burnout begins with the inability to recharge and recover during time off and includes three distinct symptoms: 1) physical and emotional exhaustion, 2) depersonalization of patients, and 3) a reduced sense of personal accomplishment. Research released at the end of 2017 by the American Medical Association (AMA), Mayo Clinic, and Stanford University found "the burden and bureaucracy of modern medicine inflict a toll on U.S. physicians and appear to be major factors influencing physicians' intentions to reduce clinical work hours or leave the profession." In fact, the research found one in five physicians intended to reduce clinical work hours in the coming year and one in 50 physicians stated their intention to leave medicine for a different career in the next two years. "An energized, engaged, and resilient physician workforce is essential to achieving national health goals. 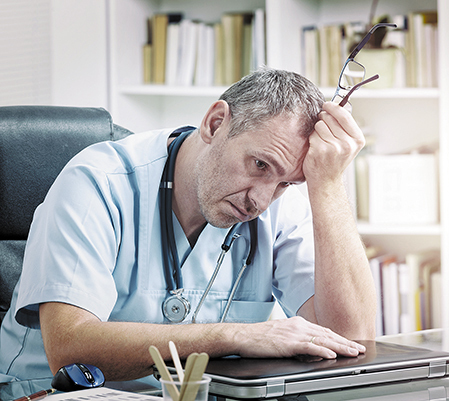 Yet burnout is more common among physicians than other U.S. workers, and that gap is as mounting obstacles to patients' care contribute to emotional fatigue, depersonalization and loss of enthusiasm among physicians," said AMA President David O. Barbe, MD, MHA, a family physician from Missouri. If just 30 percent of physicians actually followed through on their plan to leave medicine over the next two years, the researchers noted that would roughly equal 4,700 physicians exiting the workforce ... a loss equivalent to eliminating the graduating classes of 19 U.S. medical schools in each of the next two years. "The AMA is urging Congress, hospitals, and health plans to recognize the coming crisis as an early warning sign of health system dysfunction," continued Barbe. "America's physicians are the canary in the coal mine." There are a large number of factors that contribute to burnout, and specific triggers can be different for each individual physician. However, some overarching themes have emerged including technology dissatisfaction and administrative fatigue. Last fall, the AMA released research results from a separate study in conjunction with the University of Wisconsin, which found primary care physicians spend more than half their workday at a computer screen performing data entry and other tasks tied to electronic health records. The researchers found in a typical 11.4-hour workday, primary care physicians spent nearly six hours entering information in the EHR during and after clinical hours. "U.S. physicians spend numerous hours daily interacting with EHR systems, contributing to work-life imbalance, dissatisfaction, high rates of attrition, and burnout rates exceeding 50 percent," said Barbe. Research coming out of UCLA published earlier this year in the Journal of General Internal Medicine looked at physician burnout in the patient-centered medical home (PCMH) setting. While the authors acknowledged the PCMH model might seem an unlikely place for burnout since the model was developed as a team-based approach to care, the research team looked at how much primary care providers (PCPs) actually shared responsibilities and what tasks performed independently by PCPs were affiliated with higher rates of burnout. The team looked at 327 providers from 23 Veterans Health Administration primary care practices within one regional VHA network with specific attention to 14 discrete primary care tasks. The researchers found the tasks most associated with burnout when taken on by a PCP instead of sharing with care team members were interventions regarding lifestyle factors and patient education regarding disease self-care and management. Just as there are varying causes of physician burnout, there are a variety of resources and solutions emerging to attack the problem from different angles. The AMA has made burnout prevention a core priority and is working with partners across healthcare to help find solutions that enhance physician well-being. Through the AMA Wire®, the national organization is sharing ideas and best practices from sources across the healthcare spectrum to address physician wellness. The AMA also created STEPS Forward™, a collection of practice management strategies to help physicians transform their practices and achieve better work-life balance (stepsforward.org). Middle Tennessee-based M*Modal is working to address the hours spent entering data into EHRs. Recognized with a Best in KLAS #1 Speech Recognition: Front-End EMR award, the company's artificial intelligence (AI) and speech-powered solutions works across more than 150 EHRs to allow conversational documentation - rather than sitting at a keyboard typing in notes - to speed the process and decrease administrative burdens on physicians and other clinicians. "We are steadfast in our mission of creating time to care for physicians so that they can focus on their patients," said M*Modal Chief Technology Officer Detlef Koll. "As a natural extension of our speech-driven solutions and services, our Virtual Provider Assistant brings conversational AI directly into physician workflows to deliver a new level of user experience and efficiency. We are grateful to our clients who continue innovating with us along this spectrum so that clinical documentation is ultimately a byproduct of the patient visit and not a separate, burdensome task for the physician." Last fall, ProAssurance, a specialty insurer with extensive expertise in healthcare professional liability, pledged an initial gift of $1.5 million to establish an endowed chair for Physician Wellness at the University of Alabama at Birmingham. The new academic chair, which is the first of its kind in the United States, supports a research team focused on issues unique to physicians facing the stress and pressure of caring for patients in a rapidly changing healthcare environment. "Physicians have always been subject to the high levels of stress from a variety of factors such as society's expectations for successful outcomes, the threat of litigation and the effect of their professional obligations on the quality of their lives, and their families' lives. As medicine evolves to address the changing dynamic of healthcare in America, we must find ways to address these pressures," said ProAssurance Chairman and CEO Stan Starnes in announcing the gift. UAB President Ray L. Watts, MD, said the gift would enable the university to recruit an expert in the field of physician wellness to implement well-designed interventions to enhance a sustainable culture of wellness. Additionally, he said the goal would be to provide trainees with tools and resources to manage stress and burnout. 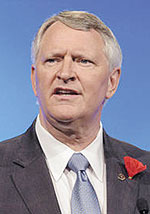 "The result will be more engaged physicians who can provide the highest-quality care to their patients," Watts added. With more than 40 percent of physicians across all specialties and approximately half of PCPs reporting feelings of burnout, finding multiple solutions to address physician well-being will be critical to providing access to care moving forward.